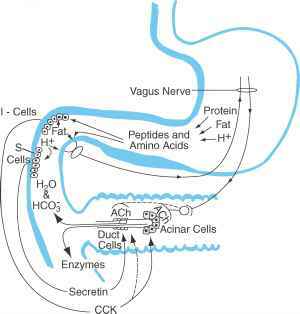 FIGURE 20 Cellular processes that best account for the secretion of HCO^ by the pancreatic ductule cells. blood from the actively secreting pancreas has a lower pH than blood from a nonsecreting gland. As HCO3" is secreted into the lumen, Na+ also moves across the epithelium, preserving electrical neutrality. Much of the Na+ diffuses through intercellular (paracellular) pathways. Water then moves into the lumen along its osmotic gradient. The rate of HCO3" secretion depends on luminal Cl" and the activity of the Cl" channel in the apical membrane. This conductance is activated by cAMP in response to stimulation by secretin and is present in ductule but not acinar cells. This channel occurs in many types of epithelial cells and is defective in cystic fibrosis. This model accounts for evidence indicating that (1) HCO3" secretion is ouabain sensitive, (2) secretion involves Na+-H+ and Cl-HCO3" exchange, (3) secretion of HCO3" occurs against an electrochemical gradient and is an active process, (4) most of the HCO" in pancreatic juice is derived from plasma, and (5) in the absence of extracellular Cl", HCO3" secretion decreases significantly.